Just like Wizkid and Tiwa Savage began sparking off dating rumours by sharing romantic gestures both on stage and on social media, Nigerian high-life musician, Flavour Na'bania and Yemi Alade have probably misled the public to belief that they are in a romantic relationship. 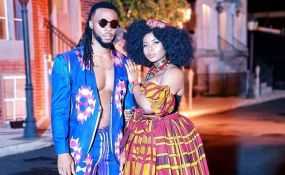 While some critics believe that their romantic pictures Yemi Alade has been sharing on social media may be a promotional strategy for Flavour's new song titled 'Crazy Love', featuring her, many believe it may be a stylish way of announcing that they are dating. Biggerson wrote, "Yemi, you are beautiful and flavour fits you die I swear, best couple in town." One Sabina also agreed that though their romance isn't as beautiful as that of Tiwa and Wizkid, they are a good match. "They both fit each other but no stew like Tiwa andWizkid", she wrote. Marjibs advised them to get married quickly; "Abeg make una get married fast o", and Nene was in support, "Abeg Yemi marry flavour already. If na me I go do the same. The guy is too handsome and I'm a great fan of his. Love you both." Tosin Olaoye wasn't left out, he wrote, "Good match if they can keep it that way and make it more mature".Another fan wrote "Perfect match". According to Emmy, this is another Tiwa and Wizkid in the making. "Another Stew in the making", he wrote, and Shashystone concurred; "You guys make a good match. The stew still de boil". Ben approved of the union; "They look good together", while one Desmond agreed too; "You guys will make a great couple", they both wrote.